Play mistakes often amount to a lack of experience. Barring an FNM the day before, SCG States marked my first event with Temur Delver since Oath of the Gatewatch, which had me gleefully—and, soon enough, disinterestedly—casting two-mana, Thoughtseizeing Tarmogoyfs. I’m not unexperienced with Temur Delver; I’ve been playing it in various forms since 2012, and with Hooting Mandrills since the Treasure Cruise ban. But time away from a deck, especially one so decision-intensive, can leave me a little cloudy. Despite my mistakes, I had a great time at States and placed 6th. Today’s article completes the tournament report. If you didn’t read Part I, check that out first. After GP Charlotte, I tested this matchup extensively. Like most tricky aggro matchups, reps made all the difference, and I now consider Elves highly favorable for Temur Delver. The deck is decidedly more linear than Abzan Company, and the more linear decks get, the better Delver tends to fare against them. I keep a one-lander with two Delvers and a pair of Shoals. My opponent has a slow start, but manages to Decay a Delver. The other blind-flips off a Lightning Bolt, and I try to hold off the army of Elves with my humble, single-mana disruption. I never make another land drop, but I do Deny a Collected Company and beat my opponent down to one life. Before I can crash in for the win, he topdecks Chord of Calling and grabs Mirror Entity to take me exactly from 17 to 0. My opponent goes really big this game, landing double Elvish Archdruid and a Spellskite to watch over his team of Dwynen’s Elite tokens and dorks. I keep the Elves from attacking with a pair of 2/3 Tarmogoyfs and a Mandrills, and we pass the turns back and forth trying to break the board stall. I manage to sneak in three attacks with the trampling Mandrills before my opponent resolves Choke. By this point, I’ve amassed enough removal in my hand to close out the game. I try bouncing an Archdruid with Simic Charm on the end step, and my opponent redirects to Spellskite, going from 10 life to 8. His play lets me Bolt one Archdruid and cast Pyroclasm to wipe out the other blockers before swinging for lethal. My turn one Delver blind-flips off a Pyroclasm, but my opponent casts a pair of Llanowar Elves regardless. I Forked Bolt them, and fearing my board wipe, he takes his time developing again. Meanwhile, I keep attacking in the air and resolve a Tarmogoyf. My opponent makes another board, and I Pyro it away after getting in with Delver and Goyf, losing Insectile Aberration in the process. I get in another attack and then reach him out with two Bolts. Pace Pyroclasm/Forked Bolt to maximize blowouts. Always Bolt the turn one dork unless you have wipes in hand and expect a second. Keep in Shoal—countering a turn one dork is still removing it. Once we get to our Huntmaster stage, Shoal can be cast for mana to counter bombs like Ezuri, Renegade Leader. Know when to “switch gears” from killing mana dorks to saving removal for lords. Hold up Denial/Leak for CoCo once they have the mana to cast it. Bring in Blood Moon on the play. I knew I was forgetting something! At States, I didn’t bring in Blood Moon. I didn’t even bring in Natural State until Game 3, since I forgot this deck (or any deck in Modern since the Twin ban) plays Choke. Infect might be this deck’s best matchup, so I can’t complain when my Round 5 opponent starts us off with a Glistener Elf. I imagine I’m in a similar boat here as Soul Sisters enthusiasts when it comes to Burn. My opener blesses me with tons of interaction. I Bolt that Glistener Elf, Shoal a Blighted Agent, and then Leak a Hierarch. My opponent fails to make a third land drop and I start to set up with Serum Visions, holding up Leak and looking for threats. He plays Dryad Arbor and passes, and I Snap-Bolt it. Soon I find Tarmogoyf, and the game ends a few attacks later. I Shoal a Hierarch, and my opponent finds himself mana-screwed for a couple of turns. He Probes me to see Ancient Grudge, two Leaks, and another Shoal, then lands Glistener Elf. I play an untapped Steam Vents after casting Serum Visions, bluffing a Lightning Bolt although I only have Simic Charm. My opponent takes the bait, cautiously poking me for two straight attacks. In the meantime, I scry Delver to the top to get a clock going, and manage to remove the Elf after it hits me for five thanks to Might of Old Krosa. Delver flips and I stay at seven infect for the rest of the game, Grudging a Spellskite and then scaring my opponent into not animating his Inkmoth Nexus with the threat of flashback. Delver starts attacking with my opponent at 15, and eventually brings him down to 1. I’m forced to Grudge an Inkmoth when he finds another one and goes for an attack. Blood Moon cuts him off the blocker and I attack for lethal. Can you spot my sideboarding mistake? It’s a big one. I cut Gitaxian Probe! Probe is phenomenal in this matchup since it’s basically free to cast, pitches to Shoal to counter crucial one-drops (including a kicked Vines of Vastwood), and gives us very useful information, since Infect plays out of its hand. That’s what I get for abandoning Delver all winter. Luckily, I’m favored enough in this matchup to enjoy a really large margin of error. A quick aside: I was doing some Yu-Gi-Oh! reading last week and stumbled upon a piece by a “Pro” player about intentional draws, which are illegal in that game’s competitive circuit. ID’s have always been an integral part of competitive play for me, so I found it interesting that some CCG players never get to do it. I may have managed to dodge my buddy on EldraziTron this tournament (who also made Top 8), but the other two decks I’d hoped to evade tracked me down. My two Goyfs meet Spell Snares, and Delver gets Pathed. My new threats get Snap-removed, and I Bolt the Snaps when they come on board. Soon, a pair of Ancestral Visions resolve and put victory out of reach. I come out blazing with a Delver and a Tarmogoyf. The latter gets Snared and the Delver eats a Path, which allows me to resolve Huntmaster of the Fells on turn three. My opponent passes on an empty board, and I attack for two with the Wolf token (holding back Huntmaster in case he has Snapcaster Mage) and pass the turn back. On my opponent’s upkeep, he responds to Huntmaster’s flip trigger by casting Snapcaster to flash back Path to Exile. I let the Snap resolve, and Path goes on the stack. I answer the Path with Stubborn Denial. My opponent has one mana up, so he smugly pays, thinking I misread the card. I cast my own Snapcaster Mage and Stubborn again, countering the Path. He asks, “draw step?” and I say okay, forgetting after the flurry of interaction to actually resolve the Huntmaster trigger, which would have killed the Snapcaster Mage. Luckily, it doesn’t cost me the game. My opponent resolves Rest in Peace, which ruins my in-hand Tarmogoyf, but Huntmaster flips a turn later and I get in a big attack. Simic Charm saves Huntmaster from another Path, and a Bolt to the face seals the deal. In sideboarding, I cut a Grudge for Revelry to deal with Rest in Peace. This game goes very long. I hold threats in hand and try to find answers to a pair of Vedalken Shackles. My opponent has a Rest in Peace on the board, invalidating my two in-hand Goyfs. Blood Moon resolves with my opponent at just three Islands, and I tap six lands for Mandrills to start hitting him. He gets Pathed after I deal 8 points of damage, and I try a second one, only to have it countered with Cryptic Command. Command also bounces my Moon, and my opponent finds a window before I resolve it again to Quarter himself into a fourth Island, stranding the Mandrills back in my hand as I search for outs to Shackles. I eventually find Ancient Grudge, but also need to draw Revelry so I can blow up Rest in Peace and get my flashback. I keep waiting, giving my opponent the time to play Spellskite and effectively lock me out of the game. My only hope is to double-Bolt the Horror, which I try doing when I see an opportunity, but one Bolt meets Dispel and my plan is ruined. Another round, another sideboarding mistake. I meant to trade Mountain for Breeding Pool to improve my Blood Moons. Instead, I forgot to remove the Pool, ending up with an 18-land deck! 18 lands really isn’t where this deck wants to be against midrange strategies. I even go so far as to cut my 17th land against Abzan and just run 16, and may have benefited from the same move against UW Control, another attrition deck featuring Path to Exile. Mountain was still good for me here, as I fetched it off a Path in both post-board games. But the deck would definitely have been better without the Breeding Pool. The most glaring mistake I made with my sideboarding was cutting an Ancient Grudge. Vedalken Shackles lost me the match, and it had no business doing so. My opponent wasn’t aware that I knew he had it in his deck (I had seen him cast it earlier in the day against someone else), so he was almost sure to keep them mained. Most importantly, Shackles is a card that will beat me singlehandedly if I can’t remove it, especially when I’m boarding out Lightning Bolts for more threats. It’s crucial to have answers to these kinds of cards in sideboard games, and I should have not only kept the second Grudge, but brought in both Natural State and Destructive Revelry to hedge against the artifact. I also knew he played Engineered Explosives, and could have assumed he ran Spellskite, although those are cherry-on-top reasons to go all-in on artifact removal. I’ll never know if cleaning up now-obvious missteps like boarding out Probes against Infect, or forgetting to remove Breeding Pool against UW Control, would have won me the tournament. All I know is I won’t make those mistakes again. Magic doesn’t reward us for holding grudges, against ourselves or anyone else. In my experience, players improve at the fastest rate when they own their mistakes and learn from errors. We’ll see how my three favorite creatures fare next time around! Against UW Control, how did he Flashback Path to Exile with RIP in play? My mistake, the RIP came down a turn or two later. My notes were a little fuzzy for this round, since I left right after losing and didn’t finish writing them down. Fixed! Yes. Most (all?) serious sports or competitive games frown upon arranging/manipulating results to gain an unfair advantage. In most places, where is proven or highly suggested that such thing occurred, the parties tend to receive a harsh punishment. But Wizards thinks is fine showing on camera, in their most prestigious tournament (pro tour), everyone that manipulating results in a “competitive” game is fine. Meant “serious” instead of ” competitive” in the last line. Happy to see old brews coming back along with new decks in this new meta. Thanks for the insight. I always thought it was a little weird, too, but I’ll take it! It looks like you brought in Huntmaster forall but one of your games (against infect). Should it start in the main board? Siding in Blood Moon versus Infect is rather ingenious. It’s an angle that few Infect pilots expect to be attacked from, yet most of their lists run seldom more than 2 forests, effectively shutting off everything in their deck. Just out of curiousity, what would have been your gameplan against the Amalgam Dredge player, had you faced him instead of taking a draw? I have tested against this deck a little online, and the less color-intensive versions are much better than the one Charles ended up winning the event with. His build would probably have been pretty easy to beat because Blood Moon wrecks it. I don’t think that list is optimal, but this deck is real, and we’ll see it in the future for sure. I keep Shoal because getting a Looting or Neonate slows them way down. My plan is basically to counter the enablers and get ahead on the board so I can finish the game before he starts playing multiple cards per turn out of the graveyard. Scour is important to get to Mandrills faster. They don’t block much so Curiosity is also fine. Denial’s great against his Unburial plan. I think Leak is too slow and it doesn’t do much once he gets dredging. Also, if Blood Moon comes down, the game is pretty much over. Ive played against him many times, and the main reason I lose is Vengeful Pharaoh. Its games over when that card hits the GY. I can deal with most other things in his deck. That card can be a real pain if they set it up. Simic Charm will protect your guys from him; just try to get a lot of threats on the table and clean him up in 2-3 attacks and VP won’t hurt you too much. Thats my goal, but it rarely happens. At least in the past 2 match ups. Does the less color intensive version still run VP? I have surgical extraction in SB just for him. Surgical’s a really elegant answer. And yeah, I think all versions of Dredge play 1-2 VP. Do you live in the Montreal area Jordan? I was under the impression that you were in Ontario, but this has me wondering. I’m moving back to the Montreal suburbs later this month and will actively be seeking out some serious testing partners. Let me know if you’re interested! Yep, in Plateau. Find me on facebook! When looking at it seriously, do you really think a mountain is the best idea in a SB that is critical to our game plan? As you have eluded to, the deck thrives on its SB. I feel like dropping a slot just to get a land swap seems inefficient. I almost wonder if its just best to put the Mountain MB and drop another land in ins place. Most decks I play against end up having me side-in moon or huntmaster anyway. Mountain might not be an optimal choice for that sideboard slot, but this deck really wants 17 lands main. I have experimented a lot with the land count and found that 18 is too many and 16 is too few. I’ve also found the deck to mulligan an unnacceptable amount of openers with fewer than 14 turn-one blue sources in the main, so cutting Pool for Mountain would not work. I like 15 blue sources to be safe. I’d only cut Pool for Mountain in Games 2 and 3 for matchups where I still want 17 lands, but also want to cast Blood Moon on time (not that many of them). I don’t think you understood what the card is truly for – it’s there to give us an 18th land for matchups we have to be very aggressive in. I’m not swapping it for another land in this case. Some obvious examples include Burn and Affinity, which punish you for missing land drops, especially when you’re relying on Huntmaster. Some less obvious examples are Tron and Infect. Is there any reason to be running Pyroclasm over Rough // Tumble in the sideboard? 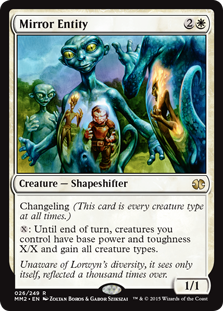 I believe that’s the Legacy tech to avoid killing your own Delvers in Elves-style matchups. Of course – Vault Skirge, Lingering Souls, Flickerwisp, etc.